Dark Fuchsia Blooms – When you need a shrub that thrives in hot, sunny, dry locations and it is very drought-resistant, the Tonto Crape Myrtle is the perfect choice. 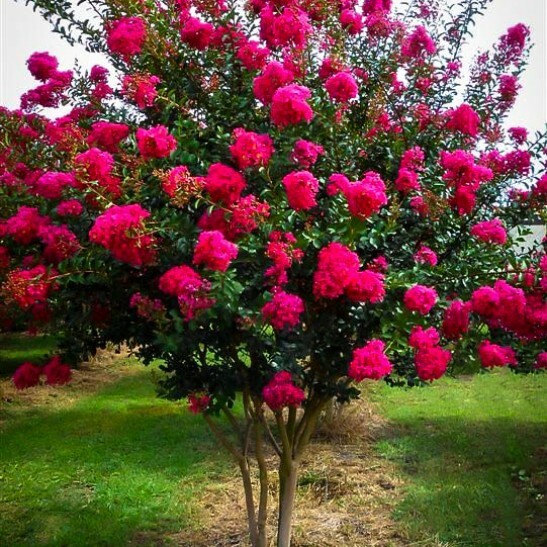 If you live in colder regions, even in zone 5 and want to grow Crape Myrtles, this is definitely your best choice, being so hardy it will bloom every year as a small shrub in zones 5 and 6. It will flower continuously from early-summer to the first frost, with large clusters of bright-pink flowers of a rich and vibrant shade. The foliage of the Tonto Crape Myrtle will stay a healthy and a glossy deep green all summer long and never look tired and dusty like older varieties do. In fall the leaves turn brilliant deep-red before falling to reveal beautiful mottled bark in shades of beige, taupe, cream and brown. If you thought you could never grow a Crape Myrtle because of your cold winters, then this great plant will prove you wrong. Crape Myrtles have come a long way from the time when they were huge trees with pale lilac flowers. 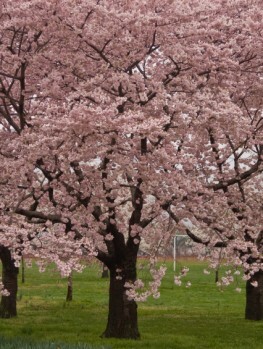 At that time they were often disfigured in summer by a white growth on the leaves, making them look tired and dusty. Over the last 50 years, these plants have been the object of intense work by plant breeders across the countries, who have given us their bounty of new varieties in many sizes and many vibrant shades, from white, through soft and strong pinks to rich cherry-reds and purples. 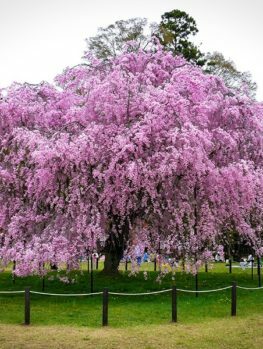 At the Tree Center we specialize in these wonderful plants and offer you a huge selection of varieties to fit gardens of every size and all tastes in color. They are also specially-bred to be free of that disfiguring powdery mildew; now the rich, glossy green foliage looks healthy and bright to show the flowers at their best. The Tonto Crape Myrtle is completely hardy from zone 7 to zone 9, so throughout the South and West this plant will thrive. 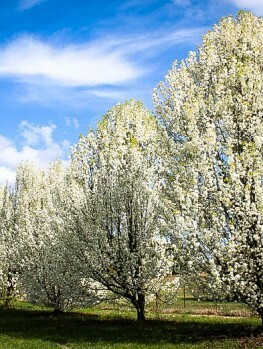 However, even if you live in cooler areas, you can still grow this plant and enjoy its blooms. It is root-hardy well into zone 5; meaning that the top-growth may be killed by winter cold, but the plant will survive and send up new shoots from the base in spring. 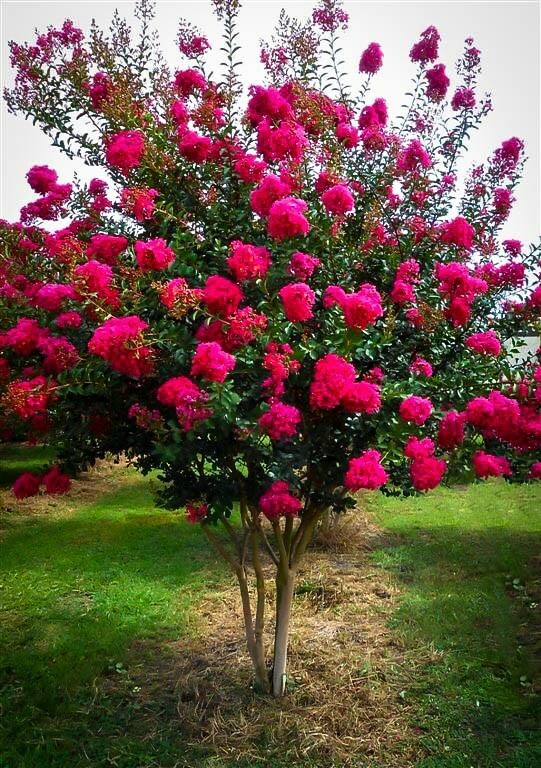 Since Crape Myrtles flower at the ends of new shoots, those shoots that come in spring will definitely flower well; it is just that the plant will not of course become so large. In zones 5 or 6 expect the Tonto Crape Myrtle to grow 4 or 5 feet tall and perhaps 3 feet wide each summer – still enough to make a spectacular flowering shrub for the sunniest spot in your garden. This plant will grow in most types of soil, from sand to clay and prefers a hot, sunny location in well-drained soil. Choose the hottest, sunniest spot in your garden to feature this stunning plant. It can be grown in a shrub border with other flowering shrubs, alone or in a group of 3 or 5 for a larger garden. It also makes an excellent informal hedge to divide one part of the garden from another, or from neighboring properties. This plant is also an excellent choice if you are looking for a flowering bush for a container on a deck, patio or terrace, where its brilliant summer colors will be at their best just when you are using the area. 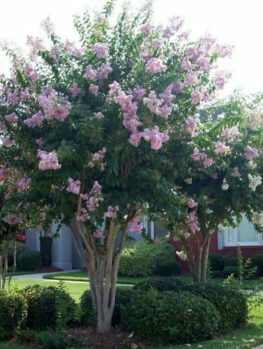 The Tonto Crape Myrtle will grow to 10 or 11 feet tall and as much across in warmer zones where there is no winter damage to the branches. 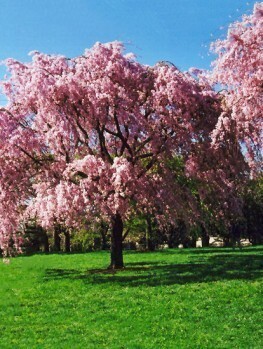 It is upright but wide spreading, with many trunks, so it is a shrub, not a tree-form for planting as a specimen in a lawn. 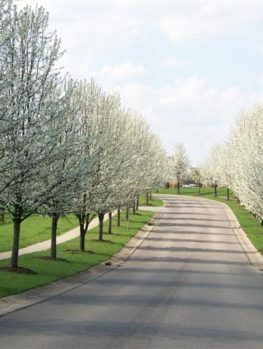 If you are looking for a lawn specimen, here at the Tree Center we recommend the Dynamite Crape Myrtle, or the Arapaho Crape Myrtle, which both grow between 10 and 20 feet tall and make spectacular specimens in your lawn. The Tonto Crape Myrtle has bright fuchsia-pink flowers in large clusters at the ends of the branches. These are produced on new shoots which grow in spring and begin to flower by early summer. Flowering will continue right up to the last frost, especially if the flower clusters are pruned off when they fade, preventing seed formation. The flower clusters are well over 6 inches long and tightly packed with flowers. The summer foliage is glossy and a rich, dark green color, free of the disfiguring white growth of powdery mildew. In fall the leaves turn brilliant deep red, putting on a spectacular display. As the leaves fall the beautiful branches are revealed, with their mottled bark in all shades of brown and beige, from cream to chestnut. This makes a very attractive winter feature, meaning that the Tonto Crape Myrtle is interesting in your garden all year round. When it comes to planting your Tonto Crape Myrtle, allow enough room, depending on your growing zone. For a hedge allow 6 feet between the plants, or closer in colder zones where some winter die-back may occur. Dig a hole or a trench two or three times wider than the pot, but no deeper. Place your plants in the hole, replace most of the soil and firm it well down. Then water thoroughly and replace the rest of the soil, being careful not to cover the roots with any extra soil. For a container, choose a large pot, like a half-barrel, with drainage holes and fill it with outdoor potting soil. 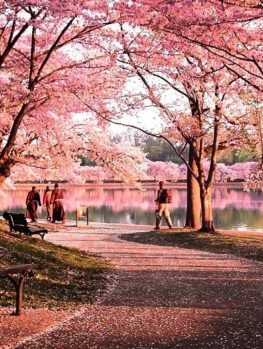 The Tonto Crape Myrtle was released in 1995 by the National Arboretum (Washington D.C.) breeding program, which develops high-quality, mildew-resistant, crape myrtle varieties. These come in a variety of sizes and flower colors and ‘Tonto’ is a medium-sized bushy variety. It has exceptional mildew resistance as well as bright, fuchsia-pink flowers. These Crape Myrtle varieties are hybrids of the common crape myrtle, Lagerstroemia indica, with a rare species from Japan called Lagerstroemia fauriei. This species gives resistance to mildew and also contributes darker brown shades to the striking patterns on the trunk. Because of the special and extensive breeding program needed to produce this plant it must be grown in the correct way. Our plants are grown from stem pieces taken from original plants of the correct form and are quite different from cheaper seedling plants that vary greatly and will not give the effect and quality of the real thing. 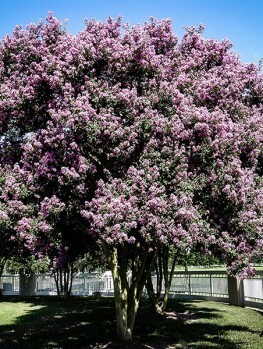 The Tonto Crape Myrtle is a relatively new variety, although it has been well-tested. Understandably many gardeners want to buy this plant. Despite receiving stock frequently, shortages can occur, so order your plants now to make sure you don’t miss out on this spectacular sun-loving beauty.